The Beautiful Fairy-Tale Dream Wedding of Chynna & David @ the Beautiful Venue, Ascott Parc (Vaughan ON), July 8th 2017. Chynna & David booked Trade Sensation Events for Wedding Planning & Decor for their Fusion Wedding of Filipino & Vietnamese Culture. 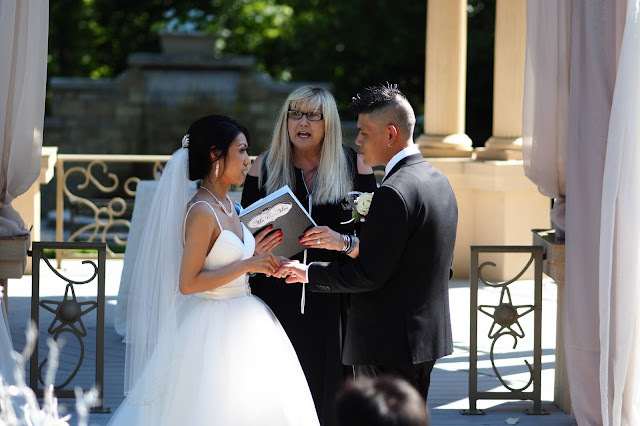 They held their Ceremony at the Beautiful Gazebo & Garden outdoor in front of the Waterfall Fountain @ Ascott Parc & their Reception in the Venue inside the Imperial Room, beside the Terrace/Patio, where their guests could enjoy the Wedding & fresh air on the deck. A Very Modern Fairy-Tale, with lots of summer Romance embedded into their Decor. We see lots of White & Silver accents, & assured to have candlelight everywhere, at every level. Chynna & David was able to honour her Late Grandfather, "Lolo" with a memory table filled with Candle Light, beside their receiving table.